It wouldn't be a modern Disney movie without Jon Favreau. Solo: A Star Wars Story director Ron Howard announced Wednesday (February 14) that The Jungle Book helmer Jon Favreau is boarding the upcoming standalone flick to voice an "important alien character." Howard confirmed the last-minute (like, three-months-before-the-film-launches last-minute) casting addition on Twitter, retweeting a snap of himself, Favreau, and Solo screenwriter Lawrence Kasdan. Favreau had previously shared the photo on his own Twitter account, but didn't give any explanation as to why the three were in the same place at the same time, or what exactly they were getting up to before the picture was taken. Thankfully, Howard cleared the air. "Wondering why we are all together? 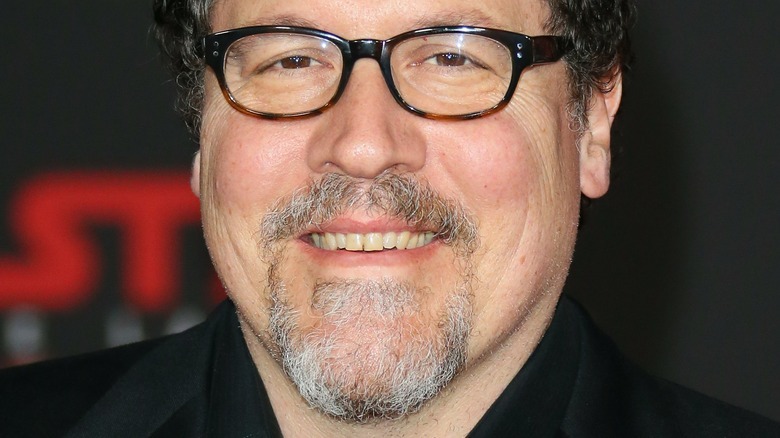 Jon Favreau is voicing a very cool and important alien character for [the] Han Solo [movie]," he wrote. "Flattered and fortunate I could pull him away from his Lion King directing duties." For anyone pondering (or even hoping) the possibility that Howard will also be lending his pipes to a new Star Wars creature, the filmmaker clarified that he's strictly sticking to behind-the-scenes work. A fan asked in response to Howard's announcement, "Any chance that you will be voicing a character?" to which he answered, "Nope … Zero chance. But thanks for asking." As Howard mentioned in his tweet, Favreau is currently hard at work directing the live-action Lion King film, which stars Donald Glover (who's also in Solo: A Star Wars Story) as Simba, Beyoncé Knowles-Carter as Nala, James Earl Jones as Mufasa, Chiwetel Ejiofor as Scar, Billy Eichner as the meerkat Timon, Seth Rogen as the rambunctious warthog Pumbaa, John Oliver as Simba's avian advisor Zazu, John Kani as the wise baboon Rafiki, and Alfre Woodard as Simba's mother Sarabi. For Solo, Favreau joins Alden Ehrenreich as Han Solo, Joonas Suotomo as Chewbacca, Donald Glover as young Lando Calrissian, Woody Harrelson as Tobias Beckett, Emilia Clarke as Qi'ra, Thandie Newton as Val, Phoebe Waller-Bridge as L3-37, Paul Bettany as Dryden Vos, and Harley Durst as Moloch. Here's the official synopsis for the film: "Board the Millennium Falcon and journey to a galaxy far, far away in Solo: A Star Wars Story, an all-new adventure with the most beloved scoundrel in the galaxy. Through a series of daring escapades deep within a dark and dangerous criminal underworld, Han Solo meets his mighty future copilot Chewbacca and encounters the notorious gambler Lando Calrissian, in a journey that will set the course of one of the Star Wars saga's most unlikely heroes." Solo: A Star Wars Story will open on May 25.